Fund My Mutual Fund: Is China Pulling an Alan Greenspan? Is China Pulling an Alan Greenspan? Some very interesting data out of China of late in terms of loan growth - in fact staggering data. Aside from being a very important economy to follow, it is worthwhile to dispel much of the bunk and hype coming from the punditry with reality checks. [Feb 9: China and the Baltic Dry Index - What is Really Going On?] Remember, 40%+ of this economy is export driven - and all Chinese customers are simply falling off a cliff - the largest economies of the U.S., Europe, and Japan are simply free falling. Japan's economy slumped at a larger-than-expected 3.3% in the October-December period from the previous quarter as the impact of the global financial crisis hit its exports hard, according to data released Monday. The steep fall reportedly represents the biggest drop since 1974. On an annualized basis, the gross economic product slumped 12.7% during the quarter. So just to stay at 0% growth, the "domestic" Chinese economy (sub 60%) would need to make up for massive shortfall in the export economy (40%+) And with imports to China also showing massive contraction (40%+! in January) - you simply cannot make any suitable business case. It is just lazy to say "baltic dry index" this or "Chinese stimulus plan" that - but that's what the pundits do and we can create a nonsense "thesis" to drive stocks up. Again let me reiterate - I do think China has the best balance sheet and will be the nexus for the EVENTUAL global economy. But we're nowhere near that point. So let's be a bit more rigorous than the folks who show up on TV with their 10 second sound bites to explain things and see what is really going on. First, a quick refresher of an Economics 101 lesson we laid out two months ago. I'll spare you the economic formulas but if you are interested, click here. Right now we have a problem of money flow - both the amount of "money" in the system, and the velocity of said money. In the simplest terms, just think of velocity as the amount of times money changes over. The higher the better. About 4-5 months ago both these areas (amount and velocity) were lacking. Capital was being destroyed in an over levered system; much of it unregulated in a "shadow banking system". For every 1 "actual dollar" in the system, 10-20-30x was "lent". Much of it was based on the housing bubble. So as the 1 actual dollar is destroyed, the capacity to lend 10-20-30x of that dollar is also destroyed - and your velocity of money crumbles. As we've outlined the past few months, our money supply is now going off the charts - the Federal Reserve has made it clear they will create money at any cost. They are going to do everything and anything in their power to liquidate the system, assuming I suppose that a currency crisis is a better outcome (or predicting no currency crisis will happen) than a financial crisis. It is very sad how we lurch from emergency to emergency in this country - but it is what it is. The Federal Reserve balance sheet which used to consist of staid Treasury Bills was at $800Billionish last year, it is now approaching $2.3 Trillion and much of that is now the junk, I'm sorry - "the undervalued assets that once the market returns to normalcy will return to their rightful value- which will be MUCH higher" - that banks want to get rid of. It is now to the point the Federal Reserve will take it said "undervalued assets" off the books of hedge funds so our shadow banking system can re-emerge (the one that got us here in the first place) They are desperate and they will do anything. So that's half the picture; the other is the even more tricky question of velocity. We are handing the banks (and other parts of the financial system) dollars by the wheelbarrow, but if they do not get circulated within the economy there are useless to everyone but banks. So we have one half the equation being force fed by the Fed/Treasury - the money supply will be ballooning - no matter the potential cost to the currency, and the other half of the equation is based on the belief that at some point so much money will be provided to said financial institutions that even the most risk averse will lend a portion. And we can begin anew. I won't even touch the long term questions this brings since we only deal with one crisis at a time. Before I write the rest of this entry don't take it as bashing the Chinese. In fact they are learning from the masters of manipulation - the United States. They are following the Greenspan playbook - to forestall a normal economic cycle flood the system with dollars... which creates new bubbles. Keep kicking the can down the road, until one day it all implodes (which is what we are enjoying now after 20 years of kicking). Did we learn from this? No... in fact the implicit policy of the Bernanke Fed is to do the same exact thing as I outlined above. The problem is the mechanisms to create "velocity" of money have been in many cases nearly destroyed (securitization) or impaired (think our banks). So Bernanke is no different than Uncle Al G. He just is hampered by lack of conduits that saved Uncle G's grits. And this is why the gold bugs are awaiting the "Great Inflation". But first we have to work through the capital destroying deflation we are enjoying... before the master government plan happens (again). At it's basis this plan relies on a financially illiterate populace (check!) - because the massive infusion of money pumps up the "price" of all assets ... including stock returns (and houses). So if you devalue your currency by 30% (which is not as easily 'measured' by the financially illiterate) but pump up the value of homes and stock markets by 30% (which on the other hand IS very easily 'measured' by the financially illiterate) the powers that be can say "mission accomplished". Because the peon class is satisfied as the government has succeeded in pumping up asset values (easily measured) while destroying their purchasing power by an equal amount (hey, why does bread cost 30% more than a year ago??) So you can tell your neighbors and work mates this is what has been happening to them the past few decades, and this is what the government plan is now and in the future. Sounds great! Surely this is a good plan right? The government has ordered them to make credit available to help battle the downturn which hit last fall. But with many industries facing overcapacity and demand slowing for many products, analyst warn the state-owned banks risk letting policy, rather than profitability, guide their lending decisions. Analysts said the structure of lending in January, with short-term financing accounting for two-thirds of the total, does not bode well for a sustained expansion. The trend suggests that demand for "attractive project finance is still insufficient to absorb excess bank liquidity, leaving banks to still pursue low risk, low return businesses in large scale," Citigroup Global Markets economist Ken Pang said in a report issued Thursday. Reuters has just announced that net new lending may have actually been and even more surprising RMB 1.6 trillion – twice the previous monthly record and an amazing one-third of credit growth in all of 2008. We will know by February 15 at the latest, when the PBoC publishes lending data, but if this is true (and the report was seen as highly credible by one of my friends at Reuters) it will probably goose the stock market up further while making people like me more worried then ever. 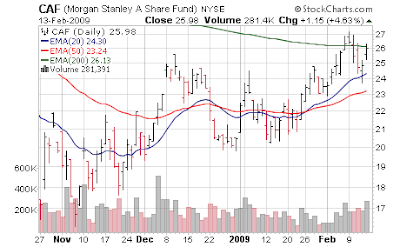 The closest investment Americans have to the Shanghai A listed shares (which is a closed system to foreigners and does not allow shorting) is Morgan Stanley A Share Fund (CAF) which we noted was showing some serious giddy up ... it has pulled back a bit but continues upward in nice fashion. So let's tie this puppy together... as we said at the top of the piece - if you throw enough money into a system the basic laws of supply and demand take over. There are limited amounts of stock certificates (supply) and a tsunami of new RMB (or US dollars when this happens in America) - so the basics of economics 101 take over. Fixed supply, huge demand = higher prices. And *magic* you have a rising stock market - which Cramer and associated pundits can scream about as "signs all is well". Boo Yah! If you look at the numbers, the 1.62 trillion yuan ($237 billion) lent in January already amounts to 40% of the value of the stimulus plan promised last November. Still, the risk is that banks are churning out loans so fast proper controls will be forgotten, leading to surging bad debts down the road. There is already speculation this new lending is behind the recent up-tick in A share turnover. Last week daily turnover in Shanghai and Shenzhen exceeded 200 billion yuan, taking it back to levels last seen in 2007. Macquarie Research said in new note that corporate earnings numbers -- not GDP growth -- matter for a stock market recovery. It said it needs evidence that China is not merely growing but successfully "re-flating" and thus avoiding a late-1990s style margin collapse. Exports appear to have fallen off a cliff after a 17.5% year-on-year decline in January, while imports have slumped a massive 43.1%. Even taking into account that Chinese New Year came in January, the results were well below market forecasts. The imports figures do not indicate much strength in China's domestic consumption. Nor does January's 23% jump in yuan deposits -- suggesting consumers are still saving, not spending. China's benchmark stock index rose Monday to a 5 1/2-month high on investor enthusiasm about added liquidity amid rising bank lending, shrugging off declines in other Asian markets on news of Japan's economic contraction. The rise was driven not by economic fundamentals but by a surge in bank lending, which has sent money flowing into the market, analysts said. The government says lending hit a new monthly high in January, driven by a massive stimulus plan. "The economic fundamentals are not strong enough to support the market's rise," said Zhang Xiang, an analyst for Guodu Securities in Beijing. "The market is in an irrational state, which is not going to last long." The rise came despite a government announcement Monday that foreign investment in China fell 32.7 percent in January from a year earlier. Turnover in Shanghai A shares rose to a nine-month high of 177.5 billion yuan ($26.0 billion) -- near levels last seen in the stock market bubble of 2007 -- from Friday's 164.1 billion. There are many potential threats to stocks' bull run. Large amounts of shares will become tradable in coming weeks because of the expiry of lock-up periods for institutional investors, and this could add selling pressure to the market. Some analysts worry that the market's strength could prompt regulators to permit a resumption of large initial public offers of equity, which could add to supply pressure. We talked about the following issue a lot in fall 2007 - some larger Chinese companies are traded in Hong Kong in an "open system" (i.e. foreign investors can partake); those shares are called H shares. In Shanghai (closed system) they are called A shares. We saw stratospheric diverengces between the A and H shares during the Shanghai bubble that eventually burst in late 2007 - and now we appear headed right back down that path. The way to read this is, the H shares are a reflection of a typical stock market - whereas in the monopoly money land of Shanghai; the A shares reflect a parallel universe. Yet commentators and pundits point to the A shares as some guiding light signal.... anything to create a thesis. The average premium of A shares over Hong Kong-listed H shares in the same companies rose as high as 63 percent on Monday, its highest level since mid-November; such premiums may not be sustainable in the long run. But the market has so much momentum that its uptrend may continue for a while, analysts said. "The trend of money pouring into the market because the market offers profit opportunities is unchanged, which could easily boost the index further," said Zhang Qi, analyst at Haitong Securities. So is it "wrong" to buy the Chinese A shares now? Not really... momentum has a way of continuing far longer than anyone thinks. But let's just be intellectually honest on what the highest probability factors are behind such a rise and dispense with the Kool Aid being lobbed by the punditry.